Cooking Time is Quality Time! Are you passionate about quality time and cooking with your family? Then this one is for you! 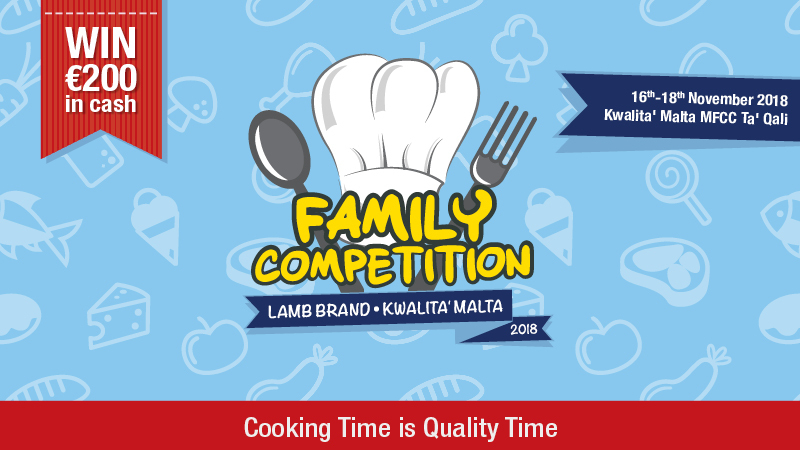 Following the huge success of the Kids Cooking Competition at the last edition of Kwalita Malta, Lamb Brand is happy to announce this year’s cooking competition, this time with a twist. This year, we are looking for families which love, fun and passion are the main ingredients to their dishes. Whether you enjoy cooking tasty desserts, or love to prepare extravagant main courses or maybe a simple plate of pasta, we want to hear from you. All teams are to be made up of 1 adult and 1 child. All children must be aged between 8 and 16 years old. Teams can be made up of parents, siblings, aunts & uncles, cousins, grandparents etc. All applicants must fill in the form and submit their application form by not later than 31st October 2018. Shortly after submitting their application form, applicants will be contacted with further details. It is very important that the chosen applicants must be available to attend Kwalita Malta at the MFCC Ta’ Qali on Saturday 17th November and Sunday 18th November 2018. You can submit your application form by clicking on the below button. A dedicated board made up of number of chefs, will choose the most original recipes. Applicants will be judged on innovation and creativity using a variety of Lamb Brand products, and presentation. 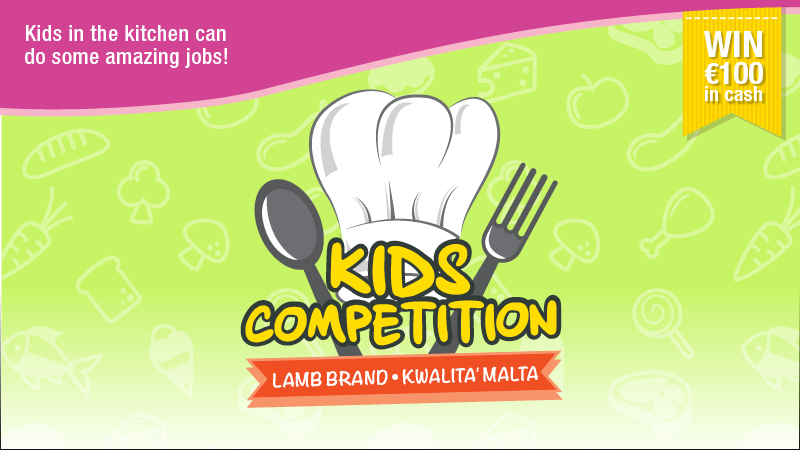 The chosen applicants will be cooking LIVE in the Lamb Brand kitchen during Kwalita Malta. Two finalists will be chosen on Saturday, where they will compete again on Sunday. The final winner will then be crowned as The Lamb Brand Family of Chefs! Each team will be given a hamper with Lamb Brand Food Products. Final winners will win €200 in cash while runner-ups in 2nd place will win €100 in cash! The Lamb Brand Figolla Bake Competition is back with a bang! We are giving CASH prizes to all those baking enthusiats who will take part in our Figolla Bake competition! 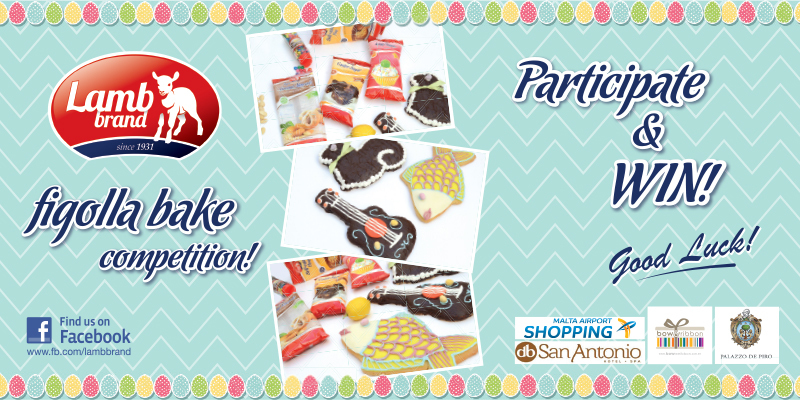 Prepare your figolli with Lamb Brand products, bake and decorate to enter the chance to WIN! Once the figolli are baked, add 2 Lamb Brand packets, which you have used in your recipe and snap a photo. Than visit Lamb Brand Facebook Page and submit your photos through the Competition App. Since we truly believe that Cooking is Quality Time, we invite all ages to be part of this competition and bake their figolli. We are giving out Cash Gifts to the best three figolli. The winner will be rewarded Euro 250 in Cash, first runner up will get Euro 150 and Euro 100 in cash to the second runner up. The first lucky winner will be chosen by a board of professional company judges whilst the 2nd and 3rd winners will be chosen from the public itself. The contestants with the most votes will place in the second and third place. It is extremely important that the photos uploaded include at least 2 Lamb Brand products, or else participants will be disqualified. The competition to enter with your figolli will end on Wednesday 4th April, however you can still submit your votes until Friday 6th April till noon. Winners will be announced on Friday 6th April. Keep Easter traditions ALIVE in our families and bake the best figolli ever with Lamb Brand! - To be eligible for the prize you must LIKE Lamb Brand Facebook Page and SHARE the Figolla Bake Competition Image. - Prizes must be collected, no deliveries will take place. - Only homemade figolli are eligible for the competition. - Figolli photos submitted for the competition should include at least 2 Lamb Brand products. 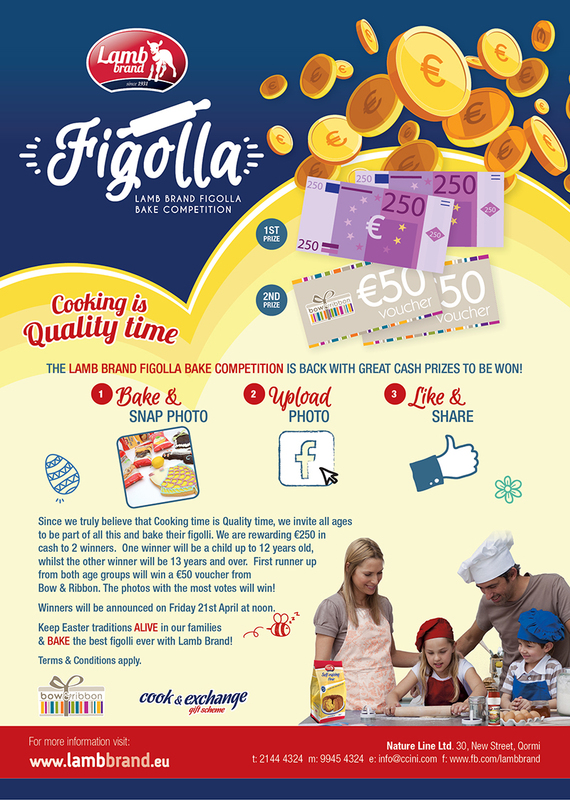 The Lamb Brand Figolla Bake Competition is back with great cash prizes to be won! Same as previous years we want you to bake and decorate your figolli and WIN €250 in cash. Once the figolli are baked, add 2 Lamb Brand packets, which you used in your recipe and snap a photo. Visit Lamb Brand Facebook Page and submit your photos through the Competition app. Since we truly believe that Cooking time is Quality time, we invite all ages to be part of all this and bake their figolli. We are rewarding Euro 250 in cash to 2 winners. One winner will be a child up to 12 years old, whilst the other winner will be 13 years and over. First runner up from both age groups will win a Euro 50 voucher each from Bow and Ribbon. The lucky winners will be chosen from the public itself since the photos with the most votes will be the winners, however it is extremely important that the photos uploaded include at least 2 Lamb Brand products, or else contestants will be disqualified. The competition to enter with your figolli will end on Tuesday 18th April, however you can still submit your votes until Friday 21st April till noon. Winners will be announced on Friday 21st April. 1. Like our Lamb Brand Facebook page. 2. Share the Competition Post. 3. Click here and then click Submit Your Photo. 4. Fill in your details, upload your figolla photo with Lamb Brand products and click Submit. 5. Share with your friends to vote for your figolla photo. 1. Log in into your Facebook account and in our Lamb Brand Facebook Page. 2. Click on Figolla Competition 2017 from Facebook's Side Menu. 4. Choose your favourite figolla photo and click VOTE. 5. Tick the box - I'm not a robot. 6. 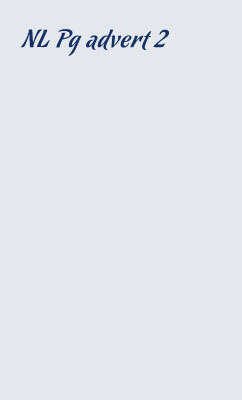 Select the images asked for by Facebook and click Verify. Attention all Lamb Brand Mini Chefs! We are on the lookout for talented kids between the ages of 8 and 15 years where cooking is their only passion. Whether they enjoy cooking tasty desserts or love to prepare elaborate main courses or just simple juicy burgers, we want to hear from them. Any child aged between 8 and 15 years can apply. All applicants must fill in the form and submit their favourite homemade recipe by not later than 30th October 2016. A dedicated board of chefs will choose the four most original recipes from each group. The chosen applicants must be available to attend at the MFCC Ta’ Qali on Saturday 12th November and Sunday 13th November, where they will be cooking live. Two finalists from each group will be chosen on Saturday, where they will compete again on Sunday. Each finalist will be given a hamper with Lamb Brand Food Products; winners from each round will win Euro 100 in cash while those placing second will win Euro 50 in cash. GOOD LUCK and see you all there! This year Mother's Day is falling on Sunday 8th May 2016, and to celebrate this day we launched this LIKE, SHARE & WIN competition to win a fabulous Lamb Brand Hamper! It's easy as ABC, all you have to do is LIKE our Facebook Page, SHARE the competition image to enter the chance to WIN a Hamper filled with Lamb Brand Products for you or your lovely Mum. The Lamb Brand Figolla Bake Competition is back! Same as previous years we want you to send us your baked and decorated figolli over on Facebook with Lamb Brand products used. All you have to do is click here, enter your details and upload your figolli photos. Share with your friends and ask them to vote for you! We will be having 30 winners in total, 3 rounds of 10 winners each! The lucky winners will be chosen from the public itself since the photos with the most votes will be the winners. Winners will be chosen on Monday 21st, Monday 28th and Wednesday 30th March 2016 at noon and announced later on the same day on our Facebook page. -A High Afternoon Tea for 2 persons from Palazzo De Piro, Mdina. - A Gift Hamper from Bow and Ribbon, Naxxar. - €10 voucher of Lamb Brand products. - €10 voucher from Bow & Ribbon, Naxxar. We are also giving out a Full Body Swedish Massage at the db San Antonio Hotel & Spa for 2 random voters! Further more, the 30 winners are expected to bring along their figolla on Thursday 31st March 2016 (Public Holiday) to participate in the Figolla Tasting Competition being held at the Malta International Airport Food Court with the chance to win Malta Airport Shopping vouchers. 3. Click here and then click Enter. 4. Fill in your details, upload your figolla photo and click Finalize. 3. Click Vote For Entries. It’s Easter time and Lamb Brand is happy to announce two competitions for our clients and Facebook followers that we would like you to take part in! Our competitions are very easy. All you have to do is to cut the right side from the competition section issued on the newsletter “toghma BNINA”, name two recipes found on any Lamb Brand Packet and enclose 3 Lamb Brand packets and send them by post to our office: Lamb Brand Easter Cooking, 30, New Street, Qormi. If you missed a copy of “toghma BNINA”, and would like to take part in this competition you can either print the above image and fill in the details and send us three empty packets on the above address or simply like our Lamb Brand Facebook page and send us a message with three recipes that you can find on our products. 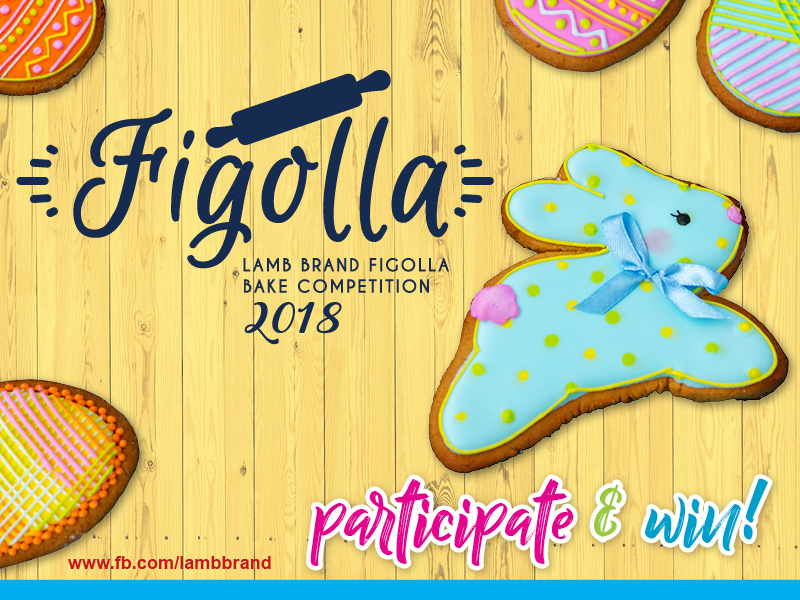 We want you to also be part of our Facebook Competition, The Lamb Brand Figolla Bake Competition. We are giving away great gifts for the best 30 figolli photos that are uploaded on our Facebook Page. The figolli with the most likes will be the winners. We wish you all the best of luck and encourage you to bake lots of figolli to win great prizes! Here at Lamb Brand we are always on the go and strive hard to introduce new and healthy products on the market. We have just launched two new products: Lamb Brand Polenta and Lamb Brand Bulgur Wheat just in time for summer which for sure you will find these healthy products handy during the hot season! Here attached you may find the promotional flyer with easy to follow recipes and information about the two products. You can download the attached flyer online, or you can collect a free copy from all leading supermarkets. One may also find this flyer for free in our Lamb Brand Medium Bulgur Wheat, Lamb Brand Polenta, Lamb Brand Breadcrumbs, Lamb Brand Couscous and Lamb Brand Potato Mash packets. Lamb Brand Bulgur Wheat will surely make great salads for you to enjoy by the beach. It is very similar to rice or couscous but with a higher nutritional value. Bulgur wheat is a good substitute for meat and is ideal for vegetarians and vegans. Lamb Brand Polenta is a good substitute for potatoes, have it grilled with some cheese as a snack or during a BBQ night out with friends. Polenta makes also a good side dish during breakfast, lunch or dinner! Try out the Lamb Brand Polenta and Bulgur Wheat and win! We have just kicked off the following competition on our Lamb Brand Facebook Page. It is very simple, all you have to do is to private message us on our Facebook page with a photo of your homemade dish using Lamb Brand Polenta or Lamb Brand Bulgur Wheat together with the recipe to win great gifts! So hurry up buy these products today and send us your photos of your yummy glorious food! Remember that we have lovely gifts to give out so GOOD LUCK! To be eligible for the prize you must like Lamb Brand Facebook Page. Prizes must be collected, no deliveries will be done. Winners will be notified through a private message on Facebook. Competition prizes cannot be exchanged for any other merchandise or goods. We will have 4 draws, one each month: June, July, August and September. Two winners will be announced each month. Each winner will be announced on the first day of the month. If the first day happens to be a weekend, the winner will be announced the following Monday. The most interesting recipes will win, but likes will always impress our judges, so ask your friends to like your posts.